The Top 10 Christmas Jumpers of 2015 - YoursTrulyHandmade.com - DIY, Home Rennovations and a lot of crafts! 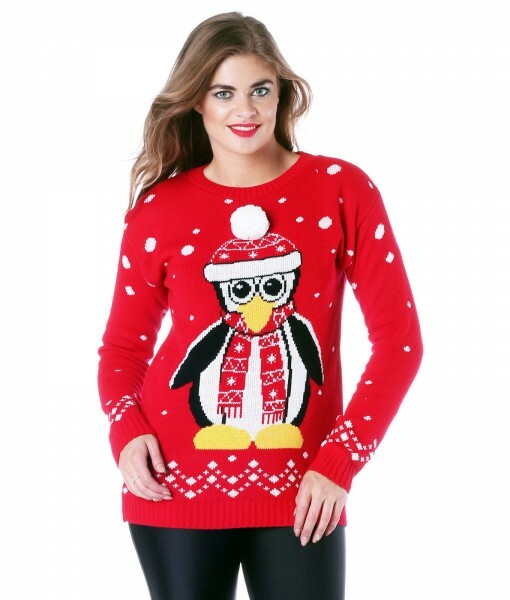 Womens Red Pinguin 3D Xmas Jumper. A 3D Christmas Jumper is basically a jumper with various elaborate details that add a whole new dimension to what would otherwise be a standard acrylic Christmas jumper. 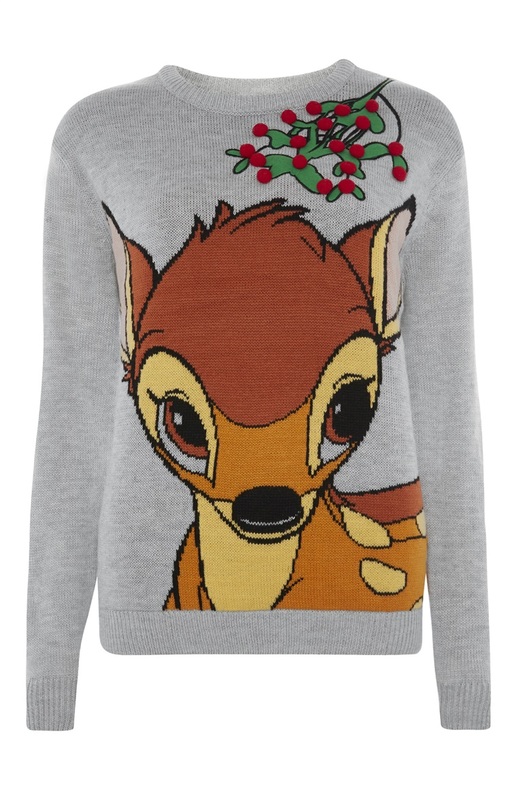 Mens Grey Reindeer Christmas Jumper. Funny Reindeer face will for sure draw a lot of attention and make a lot of Christmas smiles this year. Twosie Christmas Jumper for 2. 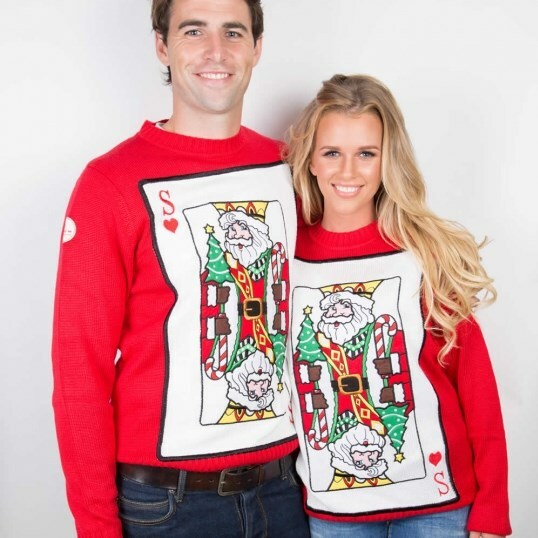 Do something different this Christmas and grab a friend, boyfriend, girlfriend, wife, husband, mum, dad, son, daughter, sister or brother and share a moment inside the Duo Christmas Jumper. Each jumper will fit 2 adults and features 2 head holes and 2 arm sleeves. 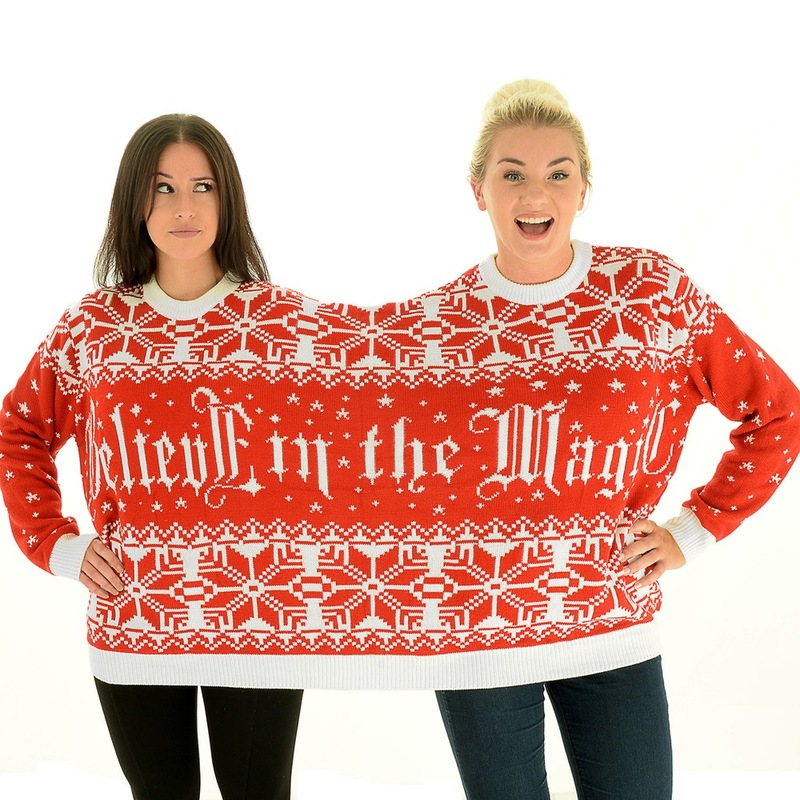 This 2 colored Christmas jumper features the wording ‘Believe in the Magic’. The Night before â€“ Light Up Christmas Jumper. The Night Before Christmas jumper looks super festive with the lights turned off, 3D glitter pompoms glistening, embroidered angel and a pile of wrapped gifts……..Then you turn on the LIGHTS! Every color you can think of. Red, green, blue, yellow, all flashing on and off in a random lighting sequence to create the ultimate Christmas jumper for any daring wearer. Cute Lady Festive Dress â€“ Ladies Christmas Jumper Dress. Cute and cozyÂ festive sweater dress. This extra long sweater features a pretty Rudolf the reindeer pattern and front kangaroo pouch. Perfect for wearing over jeans or leggings. Grey Bambi Christmas Jumper. Super cute at affordable price this jumper is simply irresistible and a must have. Santa of Hearts. This new funky red Christmas jumper is for those looking to play the game this season. Santa is the king of hearts and his eyes are on the prize. 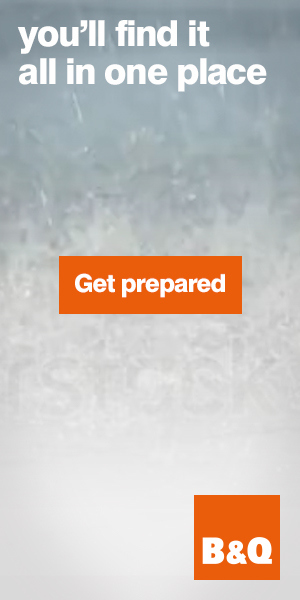 Can you handle the heat is the question? Throw in all your chips and get ready for the time of your life with this statement funky original Christmas jumper. 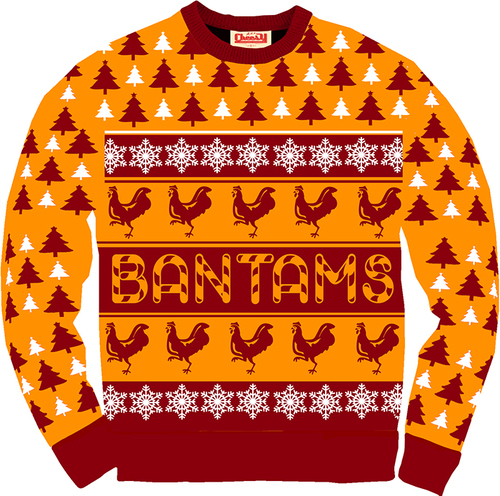 Bantams Christmas Jumper. Made from a rich, thick and downright luxurious wool. This Claret and Amber Christmas jumper is sure to make you the coolest ‘bantam’ around and keep you warmer than Devante Cole in front of goal! Womenâ€™s Snowman Christmas Jumper. This kitsch blue Snowman Christmas Jumper is unique with its jacquard snowflake designÂ (white/sky blue) and tiny snowflake background with a funky frosty Snowman’s face taking centre stage with fantastic moving eyes. Unisex Sid Snowman Christmas Jumper. 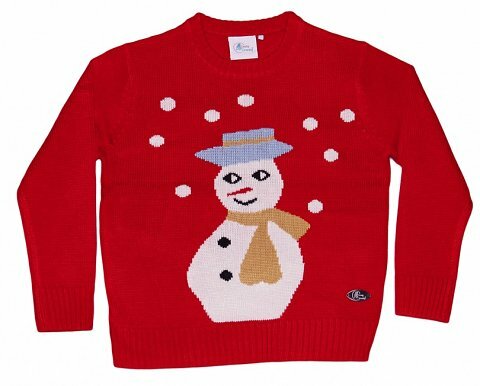 Â A lovely warm red jumper fully knitted including all the snowman and snowfall detail. Designed by Crazy Granny Clothing you can be assured that no ‘extra bits or gimmicks’ are added to our knitwear- just 100% quality knitted jumpers, just like Granny used to make!